I have been informed that you plan to publish a book written by Ron Miscavige. He says this is a book about his life. After living and working with him for 21 years, from what I have seen of his book, he has left out all the years working with us, all the benefits we had, all the benefits with the Church and the purpose we were all working for together. From what I have seen he has written about how he was treated and what life working here was like, I can say it is just a total lie. In fact, without a doubt, what he is saying is pure effrontery. I have also seen that he is purporting that he had an inside line to the top of our organization—because it was his son, Mr. David Miscavige. I have worked with Ron for 21 years and I am letting you know that he didn’t have any “inside” line with anyone. When things would occur he was usually the last to know anything. Now on my own close personal knowledge of Ron, this guy is a con man from the word go. The materials he has written are false. First of all, we were working for Golden Era Productions which is not on the level of management. Regardless of his connection with his son, he knew nothing of overall strategies. He often would come and talk to me about seeing his son and it was always on a family basis. I never heard him say anything except it was family talk. It wasn’t that he was just keeping the “secrets” for himself. He would be astounded by the new churches being formed up and the accomplishments of our various sectors and was proud of what his son was accomplishing. Now on my own close personal knowledge of Ron, this guy is a con man from the word go. The materials he has written are false. Because of his name, and the great respect we all have for his son, we overlooked many of Ron’s misdeeds and he never received proper ethics and justice in this Church. If so, he would have been long gone from here. In all the time I was here, Ron was unproductive and pigheaded. He had no work ethic. And now because he can’t live on his own, he is trying to get you to publish a book, to make money off his son. I manage a very large library of music which Ron rarely visited. Our music director spent hundreds of hours trying to coach Ron to learn new music and to help him with his scores. I personally would hear Ron making up humorous music pieces instead of doing his job—just messing around. I am a professional and I have played for virtually every star act around. Ron never practiced his parts and when it came to live performances he would just stop playing until it got to a place where he could play and would start again. This is just like having to lift a heavy load with someone else and in the middle of picking it up the other guy decides he doesn’t want to. He drops it, leaving the other guy to pull it off by himself. He had a problem with playing out of tune, which is a grave indicator of a poor player. On performances his microphone would be turned down or muted (turned off) so people could not hear it in the house. Because Ron would refuse to practice playing his trumpet, his parts for live shows were eventually reduced by the orchestrator to something no one would notice if it was missing. On performances his microphone would be turned down or muted (turned off) so people could not hear it in the house. 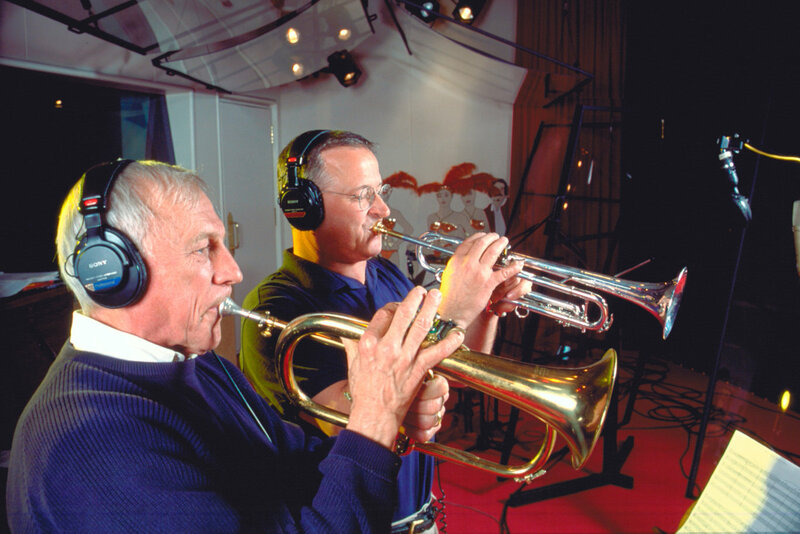 Also as the only accomplished and lead trumpet player, I did all the trumpet recording in the studio and had to also play Ron’s parts. Then Ron would complain about me taking away his job. He did record about 12 times from 2000-2012 or about once a year and every one of those parts had to be combed through by the recordist to get something usable and several times I had to go in and re-record those solos. I have many experiences with Ron being belligerent as a musician. At a rehearsal for a show I told Ron that he had missed a trumpet part when we were rehearsing. Ron said aloud for the whole band to hear, “You are trying to undermine me.” I responded, “No, you just aren’t playing your part.” Many times in the middle of songs (on show performances) Ron stopped playing even though there were trumpet parts he was supposed to be playing. When I asked Ron why he stopped playing he said the parts were too difficult and he couldn’t play them. One time I said that’s why he needed to practice and asked him if he just came along on the trip for a free ride. At this point, Ron blew up at me, jumped off the stage and complained about me to the Music Manager, like a little kid. I never got in trouble because everyone knew the situation. After playing shows around the globe, the band normally got the next day off. The perks were fantastic. I recall a time when we had a large catamaran rented for the band and we did snorkeling, had cook outs prepared for us at a private beach. There have been movies, nights off in London at great restaurants, movies, you name it. And yet he is stating the opposite? I have pictures to prove it. There are ways to evaluate people and know what their character is like and whether they are upstanding, honest individuals or a person like Ron. Ron had all the characteristics of someone utterly degraded. For instance, most of the time after a meal, Ron had food on his clothes and on his face. He smelled. He asked me to help him move to a new apartment once. I was shocked that his belongings were absolutely filthy and unkempt. There was not a piece of space anywhere free of junk. There was no space on top of a dresser, things hanging around the room, towels hanging over other towels, dust everywhere including the tub. I pulled the sheets off his bed and could see the dust fly. Ron was here and worked with us since 1985, he could have left at any time in the 27 years he was here. Yet he didn’t. Instead he is a con man and a coward. He left without saying goodbye or anything. Not a word from him, no communication at all though he pretended that he was working with a Scientology organization for all that time. And now he says he “escaped.” He could have walked any time and not wasted all of our time trying to help him and having to listen to all his stupid stories over and over and over again. We traveled all over the world. We spent a lot of time together. I laugh out loud at the thought that he is saying he was trapped. Give me a break. Ron was here and worked with us since 1985, he could have left at any time in the 27 years he was here. Yet he didn’t. Instead he is a con man and a coward. He left without saying goodbye or anything. Ron’s viewpoint on how horrible it is here is totally negated by the people who worked with him who are here. I have read many accounts written by him of how he was blown away by Scientology processes he got or courses that he took. He told me so himself all the time. If you are reading the horrible things he is claiming, you had better ponder the above. He is lying. I hope I have given you some idea of who you are dealing with. There are thousands upon thousands of Scientology staff around the world working in hundreds of organizations that would give you a 180 degree opposite viewpoint than what Ron is trying to say. Don’t give him the opportunity to malign good people who have a great purpose with this false story.